Writing in the Observer, Dr Peter Carter said nurses would have "less time to give each patient and there is no doubt care will suffer". The Department of Health said savings would be "reinvested" in patient care. 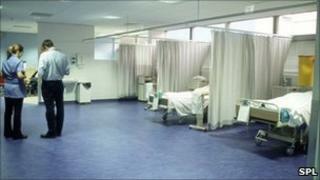 Mr Carter said the NHS was "now seeing some of the most widespread cuts in its history". "The worry is that we have seen time and again what happens when staffing levels are slashed without thinking of the impact on patient care," the RCN general secretary said. There was "indisputable evidence" linking patient mortality rates to staffing levels, Mr Carter said, citing a study that identified a 26% increase in survival rates in hospitals with the highest patient-to-nurse ratios. Media captionDr Peter Carter: "In the short term it will jeopardise the quality and standard of patient care"
"More than half of nurses have already told us they are too busy to provide the standard of care they would like. "When they are seeing further cutbacks, less shift cover, more patients to attend to, they will have less time to give each patient and there is no doubt care will suffer." He added: "The NHS is not yet returning to the days of interminable waits for treatment and trolleys in corridors, but we are worried that on the trajectory already started, it may only be a matter of time until it does." A Department of Health spokeswoman said the government had "protected NHS funding", pointing out that "next year primary care trust allocations are increasing by £2.7bn, an average increase of 3%". She went on: "In this challenging financial climate, we need to get the best value from our protected health budget. The NHS needs to cut out waste and reduce bureaucracy. Every penny saved will be reinvested in frontline patient care. "Our reforms will modernise the NHS, empowering clinical professionals to make best use of the available resources and ensure patients get the quality care they need."